Looking for a new holiday beverage to enjoy this year? 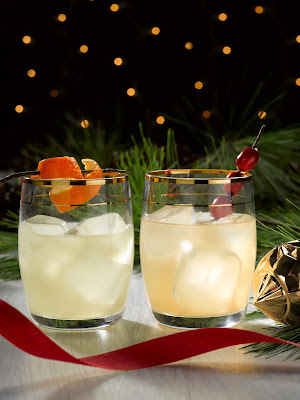 Here is an innovative holiday cocktail made with the just released Haikara fruit sake. ABOUT HAIKARA SAKE - Haikara Sake seamlessly brings together Japanese culture with America’s love for it. For the sushi, ramen, and yakitori lover on your list, Haikara will be an appreciated gift! Recently launched this fall, Haikara Yuzu is a Japanese citrus sake with a hint of lemon, while Haikara Momo is a Japanese peach sake. Haikara was created with endless mixing capabilities in mind. Crafted to be enjoyed chilled, over ice, or used to compliment cocktails, Haikara was created to give Americans a new way to appreciate sake. Add all ingredients, except ginger ale, to a cocktail shaker, add ice and shake vigorously until the outside of the shaker is frosted and beaded with sweat. Strain into rocks glass. Top with Ginger Ale and garnish. Serve immediately. I am not sure which Haikara flavor I would like more, probably the Haikara Momo since I love any peach flavor.